The new chapter contains testimony from doctors and protesters about the treatment of injured demonstrators at the Kobri el-Qoba military hospital in Cairo in May 2012. It alleges that a senior military doctor ordered subordinates to operate on wounded protesters without anaesthetic or sterilisation and reports that doctors, nurses and senior officers also beat some of the wounded protesters. It also claims that a senior officer ordered soldiers to lock protesters in a basement. The chapter concludes by recommending an investigation into the highest echelons of the army leadership – a deeply significant development. Even though the report has not been officially published, its status as a presidential document – coupled with the extent of its conclusions – represents the first acknowledgment by the state of the scale of the atrocities both during and since the 2011 uprising. "I can't overestimate the importance of this report," said Heba Morayef, the director of Human Rights Watch in Egypt. "It's incredibly important. Until today, there has been no official state acknowledgement of excessive force on the part of the police or military. The army always said they took the side of protesters and never fired a bullet against them. This report is the first time that there has been any official condemnation of the military's responsibility for torture, killing, or disappearances." According to a doctor on duty at the hospital, whose identity was withheld in the report: "Military doctors, soldiers and medics inside the hospital assaulted protesters by severely beating them and verbally assaulting them." He also described how another senior military officer "ordered doctors not to give any sorts of anaesthetic during treatment or stitching. He also ordered that their wounds should not be cleaned". The doctor also alleged that a senior military official assaulted the already injured patients "and then ordered his soldiers to lock them up in the hospital basement". His testimony is corroborated by injured protesters who were treated at the Kobri el-Qoba hospital that day. Using hospital records, investigators confirmed that all the witnesses were indeed present at the time of the alleged events. One human rights campaigner said the military's alleged actions were comparable to war crimes, as defined by the Geneva conventions. "The findings that people were tortured in a military hospital and that senior military doctors ordered subordinates to operate without anaesthetic are more than just shocking," said Karim Ennarah, a researcher on policing and criminal justice at the Egyptian Initiative for Personal Rights. "If this happened in the context of war, against prisoners of war, this would be a war crime. It's a serious violation of the most basic medical ethics in any context, let alone in the context of a demonstration where the military were facing citizens from their own country." The Abbasiya clashes in May 2012 – the second major disturbance to occur in the area in less than a year – were sparked by protests against the military dictatorship that followed Mubarak's downfall. Abbasiya is the home of Egypt's defence ministry, and became a focal point for protests during military rule. 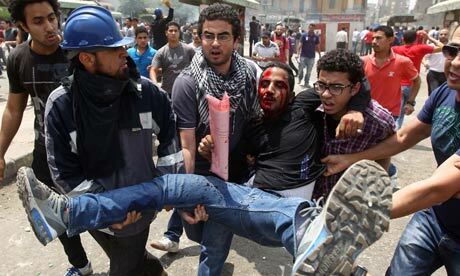 At the protests in May 2012, two died and nearly 400 were injured in battles between protesters and soldiers. But the report uses video evidence to allege there was also a third force involved in the clashes: "baltigiya", or thugs paid off by the military to infiltrate, disrupt and harm protesters. "The committee was able to confirm a collusion between security and army forces and baltigiya," the report states, citing a range of photographs, testimonies and videos that show baltigiyas eating army food, travelling in army vehicles, and joking with army officers. "We want to stay together," one baltigiya is told by an official, while another was pictured driving an army vehicle – a moment, the report states, "which leaves no doubt that civilian thugs were operating under the army commands." Members of the 16-man committee that drafted the report, which included lawyers, campaigners, relatives of victims, and members of the judiciary, expressed their frustration that the report had still not been released via official channels. The 1,000-page dossier was presented to the president in January, but a spokesperson for his office told the Guardian on Wednesday that he had not yet read it because it was still being investigated by the prosecutor general. "This report is not being regarded as it should be," said Mohsen Bahnasy, a leading human rights lawyer, and one of the senior members of the committee. "There is new evidence that needs to be investigated and none of that has happened." "The leaks expose a truth that clearly the president was hoping people would forget," said HRW Egypt director, Heba Morayef. "This report needs to be made public by the president. It needs to be published so that it can have that official stamp of endorsement." A spokesman for Kobri el-Qoba hospital refused to listen to the allegations when contacted by the Guardian. He also refused to pass on any contact details that would allow the Guardian to put the allegations to the hospital in writing. The Egyptian army did not respond to any faxed or emailed requests for comment. A spokesman for the army press office refused to comment or release contact details for other sections of the military.